If you've been dying to get your hands on Spidey Bells and the four other Christmas songs featured in the hit animated movie Spider-Man: Into the Spider-Verse, then today will make you cheer with joy. Sony Music Masterworks has dropped an early gift, with the full 5-song EP A Very Spidey Christmas. And we even have Spidey Bells for you to listen to in its entirety right here. Spider-Man: Into the Spider-Verse Presents A Very Spidey Christmas, which features music from some of the big stars in the movie, including Chris Pine, Shameik Moore, Jake Johnson and Jorma Taccone. The entire EP is available for purchase right now from Sony Music Masterworks, so you can learn all of these reimagined Holiday favorites with their Spider-Man inspired lyrics just in time for caroling over the weekend. 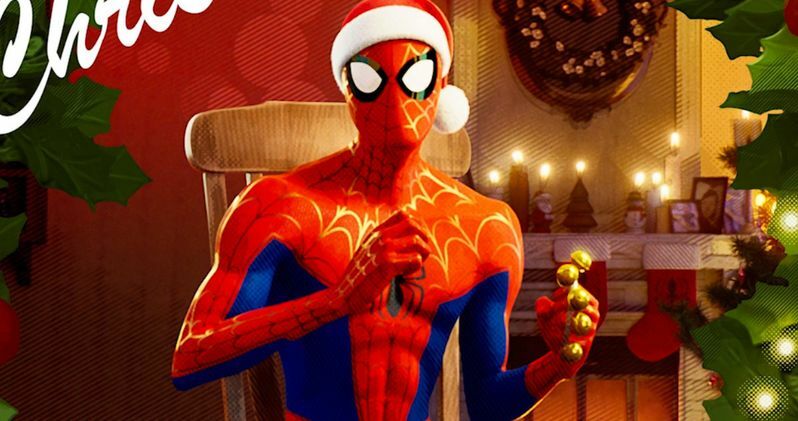 You can check out the awesome cover art for A Very Spidey Christmas below, which has Spider-Man in a traditional Santa hat, warming himself by the fire. Then listen to the first track Spidey-Bells, which features Star Trek and Wonder Woman star Chris Pine offering a Hero's Lament. As featured in the movie, it was a fan favorite. And it gives Jingle Bells, Batman smells a run for its money. Now you can listen to it over and over again as we head into the holidays, driving your relatives insane with its cheery goodness. This comes from Sony Pictures Animation.